Inside its Library and Documentation Centre, the Museo Reina Sofía presents A Throw of the Dice… a three-way conversation in two parts between dancer Israel Galván, artist Pedro G. Romero and graphic designer Filiep Tacq. The Living Museum is a new production — premiered internationally in the Museo Reina Sofía — by Mapa Teatro, and the collective’s coda to the Museo’s Fissures programme (with the exhibition Of Lunatics, or Those Lacking Sanity, until 29 April 2019). In fact, the work continues the research on madness, primitive accumulation, extractivism and colonial exploitation started in the show mentioned above. The transdisciplinary collective Mapa Teatro explores the mechanisms that build history, myth and fiction. Their theatre pieces, halfway between installations and new dramaturgies, dissect the violence which has so dominated Colombian society in recent years and dismantle the imaginaries created by colonial reason. In conjunction with the unveiling of the exhibition Of Lunatics, or Those Lacking Sanity, inside the Fissures Programme framework, Mapa Teatro will present a twofold laboratory comprising a guided tour around the show in the morning and an encounter later in the day with José Antonio Sánchez, an Art History lecturer from the Fine Arts Faculty at the University of Castilla-La Mancha (Cuenca) and theorist whose work centres on the relationship between performing and visual arts. The program will be completed with the performance lecture The Living Museum on 4 April 2019. Sarah Davachi will perform a concert for synthesiser in the Museo Reina Sofía, with approaches to her new album Gave in Rest, which, recorded in 2017 in Vancouver, largely explores timbre and space. Museo Reina Sofía presents a selection of solos, held across two sessions, by Lucinda Childs, a pre-eminent choreographer from so-called minimalist dance and founder of New York’s Judson Dance Theater. Throughout her life, German artist Hanne Darboven (1941–2009) produced different compositions with scores stretching across – in much the same way as her installations – large-scale numerical tables on paper. According to Darboven, her “systems are numeric concepts that work according to the laws of progression and/or reduction in the manner of a musical theme with variations”. 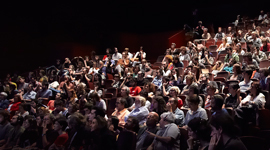 The Museo Reina Sofía presents the first edition of STUDY, an annual programme which, over two days, brings together presentations in a range of formats (stage pieces, performance lectures, actions, readings, conversations). The programme issues from the research conducted by a series of artists and researchers whose practices are tied directly to or engage in dialogue with the area of choreography and performance. This encounter, which opens the exhibition Lost, Loose and Loved. Foreign Artists in Paris, 1944–1968 in the Museo Reina Sofía, sets out to examine the complex fabric of post-war national identity and cultural politics through jazz and the relationship it bears to modern art. The encounter comprises a short lecture by art historian Serge Guilbaut, the exhibition’s curator, and a concert by bebop pianist René Urtreger. As part of the series of performing arts designed in tandem with the Community of Madrid’s Teatros del Canal, the Museo Reina Sofía presents A Mary Wigman Dance Evening (2009). The piece materialised from the interest of Ecuadorian dancer and choreographer Fabián Barba in the work of Mary Wigman (1886–1973). Laurie Anderson will conduct a performance in the Museo Reina Sofía to tie in with the publication of her latest book, All the Things I Lost in the Flood (Rizzoli, 2018), a survey of a career spanning more than forty years. Gamelan is a traditional ensemble of percussion instruments from the Indonesian islands of Java and Bali. The fascination that has stemmed from its percussive and tonality-rich sound over the past 130 years means it is regarded as one of the major influences on repetitive music and, in turn, a large part of twentieth-century music. Arbusto Ardiente (Burning Bush) was conceived after Amaia Urra’s artist residency in the landscape garden of Parc Jean-Jacques-Rousseau, Ermenonville, Oise, Paris, where the philosopher lived in the final weeks of his life. Taking this question as his point of departure, Takao Kawaguchi (1962) began, in 2013, to explore the possibilities of copying the movements of the acclaimed choreographer Kazuo Ohno (1906–2010) as a way to access the intrinsic and seemingly non-transferable qualities of this figure, central not only in Japanese post-war dance but also the universal history of the discipline in the twentieth century.